Pictured (L-R) front row: Jimmy Robbins, David Nail and Jon Nite. 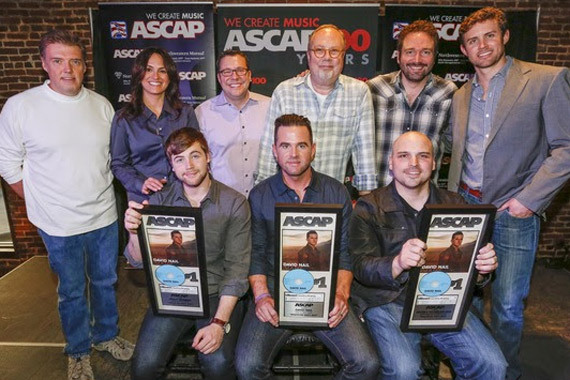 (back row): Frank Liddell, ASCAP’s LeAnn Phelan, Universal Music Publishing Nashville’s Kent Earls, Universal Music Group Nashville’s Mike Dungan, Sony/ATV Music Publishing’s Josh Van Valkenburg and ASCAP’s Ryan Beuschel. Photo: Ed Rode. Eleven weeks after MusicRow crowned “Whatever She’s Got” for reaching No. 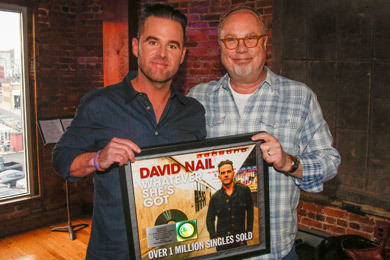 1 on the CountryBreakout Chart, ASCAP and UMG Nashville hosted a celebration where David Nail was surprised with platinum plaques for the fastest rising single of his career. The presentation was a surprise for the Nashville crowd, gathered to celebrate the success of the Jimmy Robbins and Jon Nite-written, Mercury Nashville single. ASCAP’s Ryan Beuschel welcomed Robbins, Nite and Nail to the stage at the spacious top floor of Nashville’s Cannery complex on Tuesday (Feb. 25). The celebration marked the first No. 1 party honoring Nite. Although his co-written title “We Were Us” (Keith Urban feat. Miranda Lambert) peaked at the top of the charts first, the party for that song has yet to take place. In commemoration, Beuschel honored the ASCAP member with a guitar at his first No. 1 party. “I came to town in a U-Haul with my wife and daughter living on food stamps, hoping and dreaming of this,” said Nite of the distinctions. Nite’s Sony/ATV representative, Josh VanValkenburg, gave heartfelt remarks about the pair’s history, saying, “It’s a privilege to stand up here with you.” VanValkenburg also commented on the time he invited the songwriter to the ASCAP Awards as his date, and he showed up in jeans, a jacket and old boots. “Kiss You Tonight” is currently at Country radio as the second single from Nail’s third studio album, I’m A Fire, due out next week (March 4). A preview of the forthcoming project can be seen below.